Donald Hall and Pat Corrington Wykes, Anecdotes of Modern Art: From Rousseau to Warhol, Oxford University Press, 1990. 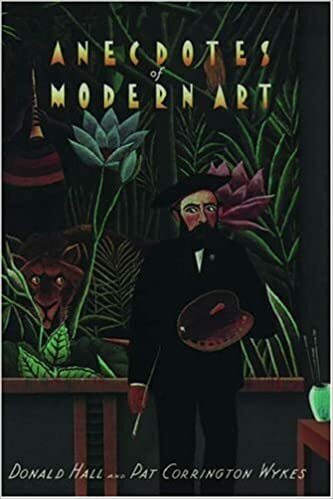 From the hilarity of Picasso's legendary banquet for Le Douanier Rousseau to the grotesque atmosphere of Andy Warhol's "Factory," Anecdotes of Modern Art moves through the modern era surveying the triumphs, miseries, and peculiarities of the world of art. Perhaps no epoch has witnessed more variety and experimentation than ours, with movements such as Expressionism, Cubism, and Surrealism radically reshaping the visual arts--and the artists connected with these revolutions are often as striking and occasionally as startling as the works they created. The anecdotes presented here--touching on almost 200 painters and sculptors--show what these artists were like, how they responded to the world, and how their work is a reflection of themselves. Here is the fabled romantic life of Belle Epoch Paris, with Picasso and Braque ("Almost every evening, either I went to Braque's studio or Braque came to mine....A painting wasn't finished unless both of us felt it was"), Suzanne Valadon parading the streets of Paris with a nosegay of lettuce and live snails, and Yves Tanguy's wife hurling a forkful of fish at her husband's mistress, Peggy Guggenheim. And there are the stories of the Cedar Bar crowd--Pollock's legendary drinking, the famous softball games in East Hampton, and de Kooning's working method ("I think I'm painting a picture of two women but it may turn out to be a landscape"). The dark side of the creative life is represented by a number of poignant tales, such as the death of Egon Schiele: Bereft at the thought of his wife's dying, he spent her last night trying to capture her in a portrait, and in so doing contracted the flu himself and died three days later. Other tales are more disturbing, from Soutine's blue, decaying chickens ("I'm going to hang it up by the neck with a nail. In a few days it should be perfect") to Rothko's tragic suicide. And the notorious eccentricities of artists are all here too: Kokoschka's lifesize doll which he took for drives in his carriage, and Dali's obsessive routines (every day he ate the same food in the same restaurants and took the same walks, carrying a little piece of driftwood to ward off evil spirits). But most of all, Hall and Wykes have brought together some of the most revealing insights into the artistic process itself. From Dufy's theory ("Nature, my dear sir, is only a hypothesis") and Picasso's wisdom ("You can't escape your own period. Whether you takes sides for or against it, you're always inside it"), to Sargent's reflection on the genre for which he is famous ("A portrait is a picture in which there is just a tiny little something not quite right about the mouth"), Anecdotes of Modern Art offers a unique glimpse into the private and working lives of many of the best-known artists of the modern era. If I tell you a book is an encyclopedic and fast-paced tour of the interrelationship of making art and being in pain, need I say more? Anecdotes of Modern Art, which hit the shelves in 1990, was a joint project by Donald Hall and Pat Corrington Wykes. The two of them undertook the work of excerpting the most arresting, enlivening, depressing, odious and/or inexplicable stories from a vast array of texts on the lives and creative practices of artists from (as the subtitle states) Rousseau to Warhol. Hall is a poet, and the book’s organization tracks with a poet’s sensibility; topics listed in the index include Accidents, Agony at parting with work, Children, Dirtiness, Fears, Inability to work, Love affairs, Misanthropy, Physical Strength, Precocity, Rivalry, Shyness, Suicide, Trains and War. Topics with the highest number of citations are Animals, Death, Drinking, Money and Portraits. Within the book’s individual sections, Hall and Wykes assemble and contextualize the anecdotes with brief introductions such as, ‘The more artist he became, the less snob’, or ‘When she was older her paintings became fashionable and she grew rich; she adopted bourgeois taste but not bourgeois manners’, or ‘As a good Communist, he knew that he should be expelled from the Party’, or ‘Duchamp gave him a glue carton labeled “gimme strength” ’. Many of the stories that follow traffic in either the cultivation or the rejection of an identity – as an artist, as a consumer of culture, as a creature of politics, as a member of an economic class. While a portion of the stories’ appeal comes from their easily extractable one-liners (Ad Reinhardt’s tidy ‘The artist as businessman is uglier than the businessman as artist’; Suzanne Valadon’s anti-bathing slogan ‘Washing is for pigs. I am a monkey, I am a cat’), it’s ultimately a much deeper tribute to the beauty of bohemia, as well as an invitation to the thorny exploration of how artists weigh the pros and cons of capitulating to the institutions they rely on for their survival.